Wanderlust, the world’s leading travel magazine, has selected my Land of Giants photo safari as one of their top trips for 2012. A feature in the December 2011 issue details their 50 best new trips for 2012, which includes this exclusive photographic tour to Africa’s Limpopo Valley led by myself and carnivore expert Peter Neville. Peter and I are offering just six guests per trip the opportunity to join us on this safari combining specialist photographic guiding with expert carnivore insight. Being home to Africa’s true giants – big cats, great herds of elephant, huge baobab trees, large birds of prey, the striking kori bustard (the world’s heaviest flying bird), the ostrich (the world’s largest bird), the massive eland (the world’s largest antelope) and the giraffe, world’s tallest mammal – the Limpopo Valley is rightly known as the Land of Giants. I mentioned in a previous thread that South Africa’s Mapungubwe Cultural Landscape is under threat from a coal mining application. This week, the fight intensified to stop construction of an opencast and underground mine just six kilometres from the boundary of the Mapungubwe National Park with a host of non-governmental organisations appealing against developments in the process, including the Endangered Wildlife Trust (EWT), World Wide Fund for Nature (WWF), Birdlife, the Peace Parks Foundation, the Association of South African Professional Archaeologists, the Mapungubwe Action Group and the Wilderness Foundation South Africa. Australian-based Coal of Africa Limited (CoAL) was recently granted the go-ahead to commence with the construction of the coal mine yet serious questions are being asked about the integrity and validity of the Environmental Management Plan (EMP) submitted by CoAL. The appeal details many specific concerns with the EMP, particularly how it misrepresents the consequences of mining in the area. Take a look for yourself, even to an untrained eye it is clear to see which side of the EMP’s bread is buttered. I hope that I am wrong but I can’t help but feel this is all too little too late however. The load shedding which has afflicted South Africa in recent years has been due to a serious shortage in the country’s electricity supply. Desperate to avoid a repeat of such a ridiculous, embarrassing and shambolic situation in the future, the government was never likely to turn down a coal mining application with stocks running so low. The crippling transport strike which has damaged South Africa’s industries recently has also affected coal exports, mainly to India and China. With the government struggling to hit its coal export targets and pay for the country’s pre-world cup face-lift, the promise of a shiny new coal mine was never likely to be ignored. The moral of the story? Never forget where you’ve come from. Mapungubwe is rightly celebrated as a great Southern African civilisation, the very place where kingdomship started in Southern Africa and a state that had vast trading links to East Africa and the Arab world. How ironic that it is the country’s modern day trade links that threaten to destroy and devalue that legacy. In a region bustling with development and about to welcome one of the world’s largest sporting events in the FIFA World Cup, in a continent that has just counted it’s one billionth person, it is hard to see space for the expansion of safe habitat for a pack animal like the African wild dog. But new protection and landscape-scale conservation efforts may offer hope. 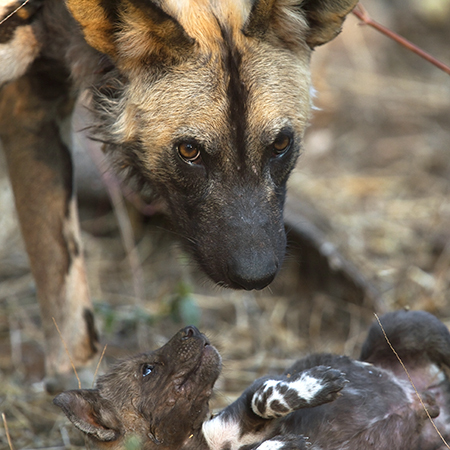 Wild dog packs utilise such huge areas that there are few reserves in Southern Africa big enough to home sustainable, stand-alone populations. When one or more dogs disperse to form a new pack, their reliance on safe and suitable habitat becomes even greater. Thankfully, the UN Environment Programme has made the move to upgrade the status of the species to migratory. This not only promises greater protection but also calls for further regional cooperation towards securing agreements over transfrontier conservation areas like the Greater Mapungubwe area. 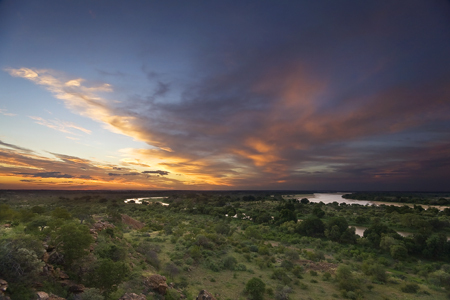 The heart of the Greater Mapungubwe Transfrontier Conservation Area (TFCA) lies at the confluence of the Limpopo and Shashe rivers – the meeting point of South Africa, Botswana and Zimbabwe. If this vision of a cross-border haven can be realised then it may secure the future of the few wild dog packs living in the region. Lions, the wild dog’s greatest natural enemy, are low in numbers here but this does not mean the dogs can live without threat or fear. Rural communities live off the land here through necessity as well as tradition. 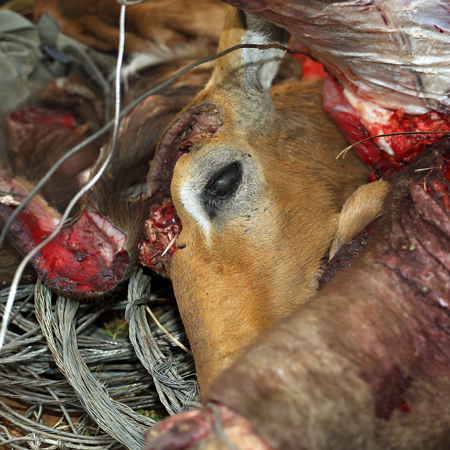 The snares left by poachers and the diseases carried by domestic dogs used by hunters are a real threat to wild dogs, as well as the ever- busier roads transecting the habitat and a local farming and hunting community that is largely unwelcoming to carnivores. Despite such threats, the area has already received the vote of confidence as a safe habitat for wild dogs with the translocation of a pack from South Africa’s Marekele National Park to Botswana’s Northern Tuli Game Reserve in 2007. 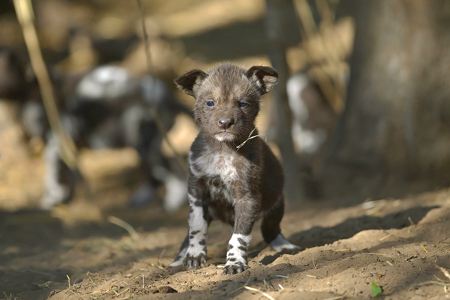 Since then, the pack has thrived in its Limpopo forest home with 25 pups in the last two years. In KwaZulu-Natal in eastern South Africa, wild dog numbers are on the increase too despite a declining international population. The region’s jewel-in-the-crown, the Hluhluwe-imfolozi Park, can boast arguably the country’s most stable population and with new packs now established on geographically isolated reserves elsewhere in the province, the new challenge facing conservationists is how to maintain the genetic balance of the population. 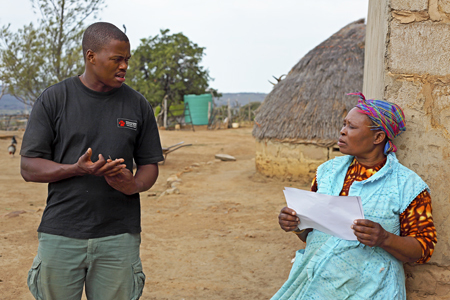 Rather than imitating natural movements by physically darting and translocating wild dogs between these reserves, Endangered Wildlife Trust officers are working with local rural communities to establish safe routes of dispersal to link isolated populations. 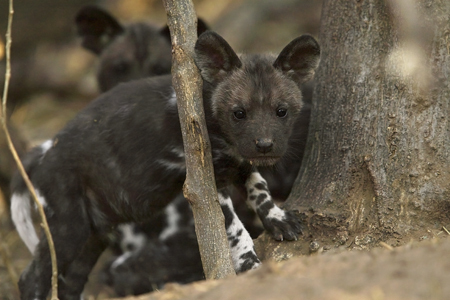 They may be subtly different yet both the proposed Greater Mapungubwe TFCA and the KwaZulu-Natal approaches to African wild dog conservation offer solutions for the future of a migratory species in a changing landscape. In both cases, those responsible for the safeguarding and development of the species will have to deal with the challenges dished out by a constricting human world. Although by engaging with local communities, landowners and farmers, it can be hoped that both processes will allow for a wider understanding and appreciation of the wild dog. Though in some areas, simple tolerance would be a victory.